Hot on the heels of Cisco’s murder of the Flip, Samsung has announced a new impressively rugged portable video camera of its own: The Multi-Proof W200 Pocket Cam. The “Multi-Proof,” in this case, refers to the W200’s durability: It’s shock-proof and dust-proof, works underwater, and sports various coatings to weather the effects of fog and condensation. 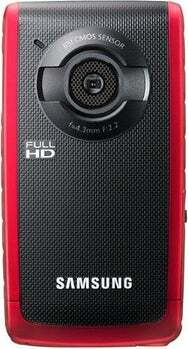 And thanks to the W200’s Aqua Mode, underwater video should look bright and clear. Like the Flip (may it rest in peace), the W200 features a built-in USB arm that snaps out when you’re ready to sync your footage back to your computer. The camera uses a 5-megapixel Back Side Illuminated CMOS sensor, has an F2.2 lens, and shoots in full HD 1920-by-1080 resolution. The W200’s screen is a 2.3-inch LCD. Photos and videos are stored on a Micro SD card. Samsung says that the camera will become available in May, for $159. Of course, since Samsung has yet to feature the W200 anywhere on its Website, it may be a bit tough to pre-order.